The Garden features dozens of permanent pieces of art, including sculptures and water features. 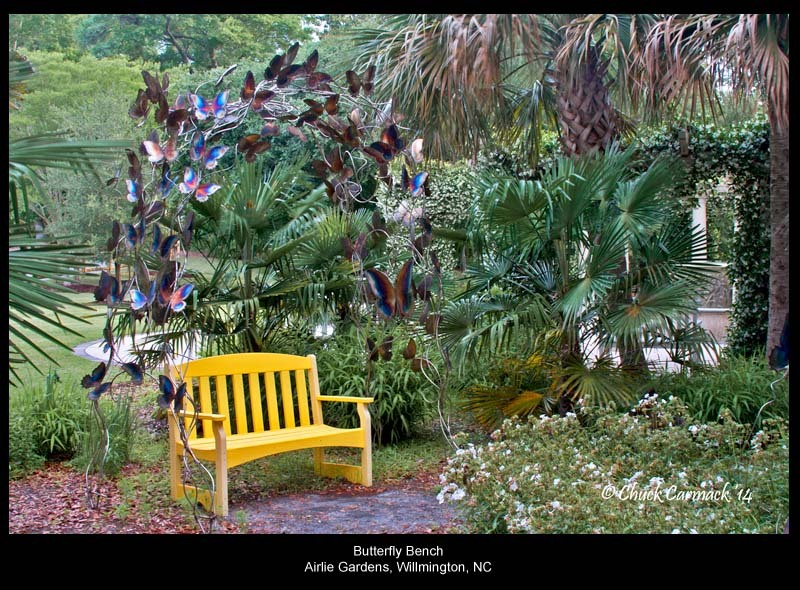 Brief Description: This tribute garden honors Airlie Garden’s longtime gatekeeper and visionary artist, Minnie Evans. With an array of sculptures created by local artists inspired by Minnie’s work, the centerpiece is the Bottle Chapel sculpted from glass bottles, cement, and metal. 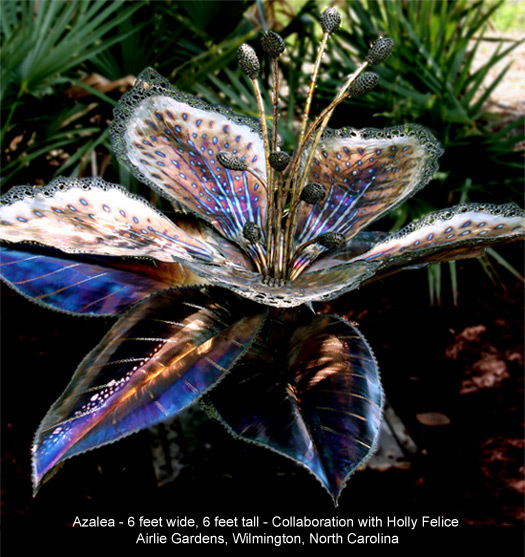 Brief Description: Inspired by the art of Minnie Evans, Airlie Garden’s longtime gatekeeper and visionary artist. Based on the creature Minnie Evans called her “funny green animal” the sculpture is elaborated with swirl shapes, eyes, horns, and leaf forms that are present throughout Minnie’s work. Brief Description: Azalea Flower 6 feet wide & 6 feet tall. The sculpture is made of stainless steel heated with a torch to bring out vibrant colors that include cobalt blue, burnished bronze, and coal black. 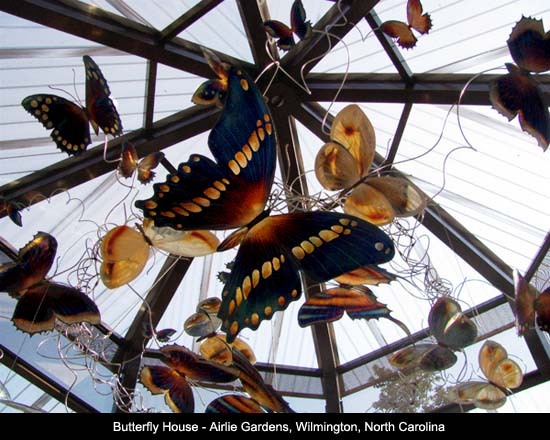 Brief Description: A kaleidoscope of metal butterfly sculptures suspended from the roof of the Airlie Butterfly House. The sculpture is made of stainless steel heated with a torch to bring out vibrant colors that include cobalt blue, burnished bronze, and coal black. Brief Description: A kaleidoscope of metal butterflies formed into an arch. The sculpture is made of stainless steel heated with a torch to bring out vibrant colors that include cobalt blue, burnished bronze, and coal black. Brief Description: Large copper personified frog sculpture with butterfly net. Brief Description: Large copper personified frog sculpture on bench reading newspaper. Donated in memory of Rhoda & Earl Brown. Brief Description: Two, 3-foot-tall bronze deer sculptures originally owned by the Corbett family and donated to Airlie Gardens in 2009. Sitting at entrance of Pergola Garden. Brief Description: Added to the Gardens by the Corbett Family (owners of Airlie 1948-1999). Several cement busts of the mythical Greek God Pan are located by the fountain in the Pergola Garden. Brief Description: Airlie’s Logo in stained glass. Hangs from front window in main building. Donated to the gardens in 2008. Brief Description: Originally constructed in France in the late 1700s or early 1800s and installed at the entrance to Airlie Gardens in 1920. A full restoration of the gate was completed in 2014. Star News Online Article about Gate Restoration.